Chandrababu Naidu said the centre is neglecting Andhra Pradesh and hasn't released funds for its development. 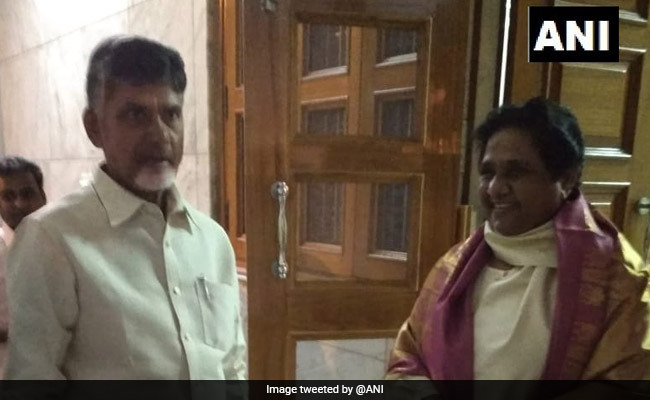 Andhra Pradesh Chief Minister N Chandrababu Naidu met Mayawati at her home today. Political parties have to set aside their differences and work as a team to defeat the BJP in the Lok Sabha elections in 2019, Andhra Pradesh Chief Minister N Chandrababu Naidu said on Saturday, as he met his counterpart in Delhi Arvind Kejriwal and Bahujan Samaj Party chief Mayawati with the message that he was acting as a "facilitator" to bind an opposition coalition. Mr Naidu met Aam Aadmi Chief (AAP) chief Arvind Kejriwal, Loktantrik Janata Dal (LJD) founder Sharad Yadav and former Jammu and Kashmir Chief Minister Farooq Abdullah to forge a larger front against the BJP. "I want to help the process to work together. If there is consensus, we will work together. I'm doing my bit. I'm acting as a process facilitator. I'm not interested in becoming the prime minister," he added. He, however, admitted that it would be difficult to bring everybody on the same page, but it isn't impossible. "The matter to discuss is whether we can sit together and contemplate how to save the nation. We have to see whether we can save the diversity of India so that everybody from poor to rich feels that he belongs to this nation. Today, nation is in disarray," said Mr Abdullah. The Telugu Desam Party (TDP) chief said that coalition governments have done well in the past and "if the leader is good and effective, development will take place even in coalition. In the past, more growth and development has taken place under coalition governments". He alleged that Prime Minister Narendra Modi was victimising everyone who opposes him. "Income tax raids are being conducted ahead of assembly polls in several states. Institutions have collapsed. Central agencies are being used against politicians. Tomorrow, they can attack me. The democracy is in danger," he said. Mr Naidu, whose TDP exited the ruling National Democratic Alliance in March, over special status for the state, said some political parties are "afraid" to join a non-BJP group today because of the pressure from the ruling BJP, but parties will eventually come together. "We have to move forward. There are political compulsions, there are ideological compulsions... and but we have to consider the overall interest of the nation and how to join hands," he said. On joining hands with the Congress, Mr Naidu said the two parties are part of an alliance against the ruling Telangana Rashtra Samiti in Telangana. The Congress had divided the state and promised special status which the BJP-led government did not implement, he said. "...PM Modi should have called a meeting of Telangana and Andhra Pradesh. Wherever they committed, they should have sorted out. If there were differences, they should have been addressed. That is the role of a PM," he said. The minister alleged that the centre is neglecting Andhra Pradesh and hasn't released funds for development. Relief fund for Titli-hit districts has also not been released, he said.